> Dave took Luke and Jack camping on Thursday, and the plan was for me to meet them after work on Friday. Well, first the campsite was closed, then they could only get one night at another campsite, then they got 2 more nights in another spot, so they had to pack up and move, and then it rained and then the wind blew the rain shelter/tarp into bits. Then I got there and convinced them to go home. Good thing, since Jack threw up all day yesterday. “I can’t wait to play with your present tomorrow Daddy.” Etc. 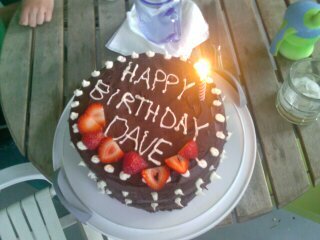 Dave likes a pink cake with chocolate icing, so this year, instead of the pink (strawberry? cherry?) 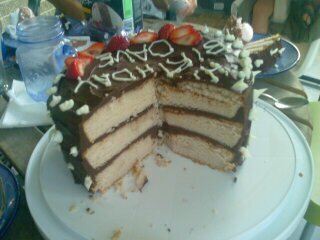 cake from the box, I made a triple layer strawberry cake with chocolate ganache icing. It was really good. The batter seemed really pink from the strawberries, but I guess I should have added food coloring too. Mmm. So good. It calls for 8 egg whites, and I used a trick I learned from the cupcake class, where you separate the yolk from the white one at a time in a little bowl and then dump the recently seperated egg into the bowl with the rest, so you don’t waste a lot of eggs by getting yolk in the main egg bowl on the 7th or 8th egg. However, I forgot to add in the last egg white , so I imagine that this cake would have turned out 1/8 again as tall if I hadn’t made that mistake. This entry was posted in Camping, food, Luke, Quotes on June 28, 2009 by metamegan. >I agree with Molly! I am on Weight Watchers so it REALLY looks yummy to me!